Happy Friday! 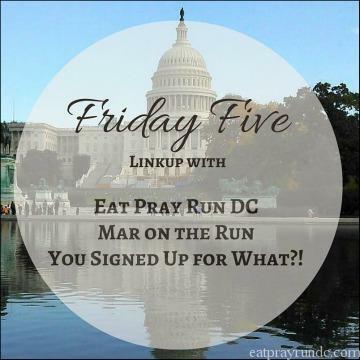 This is the fourth Friday of the month and it’s a free Friday in our Friday Five linkup. Today, I thought I’d share five things to know about Pure Barre Platform classes. As you probably know if you read the blog or follow me on Insta, I’m a Pure Barre fanatic. I love it so much. When Pure Barre introduced a new type of class, Platform, I wasn’t sure what I’d think or if I’d like it. 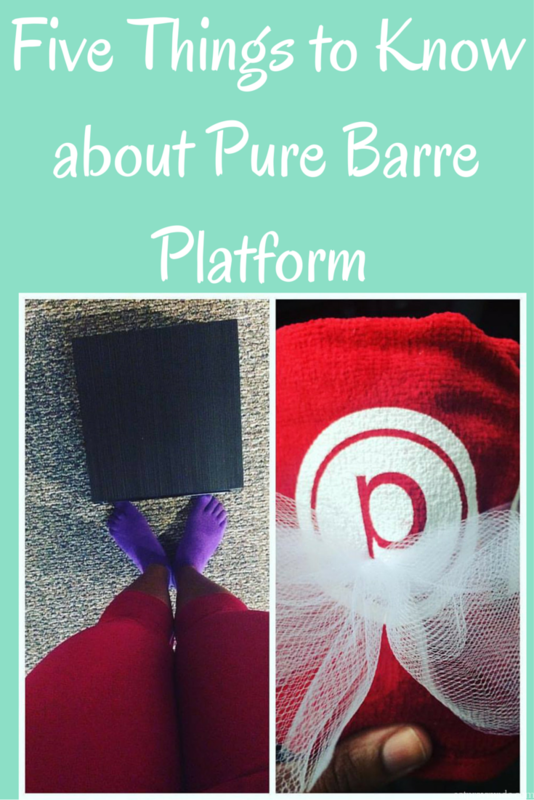 What is Pure Barre Platform? From the Pure Barre folks: Pure Barre Platform is a new fast-paced class designed to optimize cardiovascular results and increase total body strength. This heart-pumping class combines quick bursts of high intensity, yet low impact cardio work with periods of lower intensity muscle-sculpting movements. These 55 minutes of high energy, fun and intense interval training at the barre will help you burn calories, jump-start your metabolism, and increase your overall endurance. What does that mean? It means that after your first Pure Barre Platform class you are going to be like “what the what just happened? !” Have no fear – it takes a few classes to get it down and then you’ll start loving it. Pure Barre Platform is a cardio workout. One of my favorite things about regular Pure Barre classes is that I can take them after a run and it’s fine. Not the case with Pure Barre Platform. A Platform class will leave you dripping sweat and exhausted. It is an amazing workout. Don’t try to run and then do it – be kind to your legs! The movements are different. In a typical Pure Barre class, the focus is on small movements. Platform is almost the opposite – it’s like Texas, everything is bigger. Just think BIG! It takes a few classes to get used to. I mentioned this above, but it’s worth reiterating in its on bullet point. Platform classes are different – but stick with it and it’ll make much more sense. I was so confused and felt like I was just flailing around and not working anything properly and not doing it right and honestly, I thought I might hate it at points during my first Platform class. But I went back and it got better. I started to understand what I was actually supposed to be doing and getting the movements. Stick with it. You will FLY! Okay, so my absolute favorite part of class is when we fly off the platform. It’s a bit hard to describe but it’s what I’m doing in the picture below and it.is.awesome. Have you tried Pure Barre Platform yet? I haven’t tried Pure Barre Platform but sounds like fun and a great cardio workout! I haven’t even tried the regular Pure Barre yet. But I like the cardio aspect of Platform and I want to fly! Great pic! Ahhhh this sounds awesome! I want to try this out! Alaska so needs a Pure Barre or Barre3 studio! Hmm. It sounds like something I’d like better as long as I could figure out the moves. You know what I like about this? Regardless of whether or not people really like it or not, Pure Barre is still working to try to develop their programming and take their offerings to the next level. They aren’t being complacent, and I really respect that! Sounds like an awesome workout. I always like switching this up from running. I need to find a class around where I live. I think I”d like that flying stuff! Becky has really pushed me out of my comfort zone and I’m loving it! I still have to try Pure Barre. I found a studio near my apartment so I think I’m going to try it this summer! I tried Platform when my studio started offering it, and I prefer the regular classes. The smaller movements are what have been helping me strength train, and I like being able to this Pure Barre around my running. I really feel like my strength is better and to be honest, my seat’s looking good too. I’m sure I’ll try another Platform classes down the road, but I’ll stick to the regular for now. No, I’ve only done one so far. More instructors are being trained, so I think more classes will be available. They normally sell out very quickly. That’s awesome!! I have loved barre classes in the past. this sounds amazing!! is this what we’re doing on the 10th? I’m excited! We are not doing Platform on the 10th but let’s take a class together soon – Platform than Cathedral Commons hanging?? I think you’d love it!! Wow, that sounds like a fun class. I still have yet to try a Barre class but I’ll see if we have anything like this in my area. I have only done a couple pure barre classes , but I truly loved them. I wish they had childcare, because I would rock the crap out of some barre classes every week. They compliment a running training so well. I’m looking forward to trying out Pure Barre in a few weeks! I take some barre classes-it’s not the most comfortable thing for me, but I like the change in workout. Pure Barre is coming to Bmore so I’d love to try one of their classes! I’m not familiar with Pure Barre at all, but it sounds interesting. It’s been awhile since I’ve been to a group fitness workout. I used to go as I enjoyed the atmosphere but the timing now never works for me. Sounds like a good complement to your running. That looks like a great workout! My friend just bought a Pure Barre studio so I will have to check that class out. I’ve only taken the regular class so far. Have a great weekend! Sounds like a fun class! I hope to get to a barre class one of these days! That “fly” is awesome! I’ve never tried Pure Barre but I’ve done modified barre workouts and they’re killer (they hurt so good). This takes it to another level! Wow! Very impressive!!! I’ve never even heard of it . . .
I’ve never tried Pure Barre, let alone the Platform, they sound interesting.